PlasticMinimalism: My first ‘Plastic-Free Tuesday’! 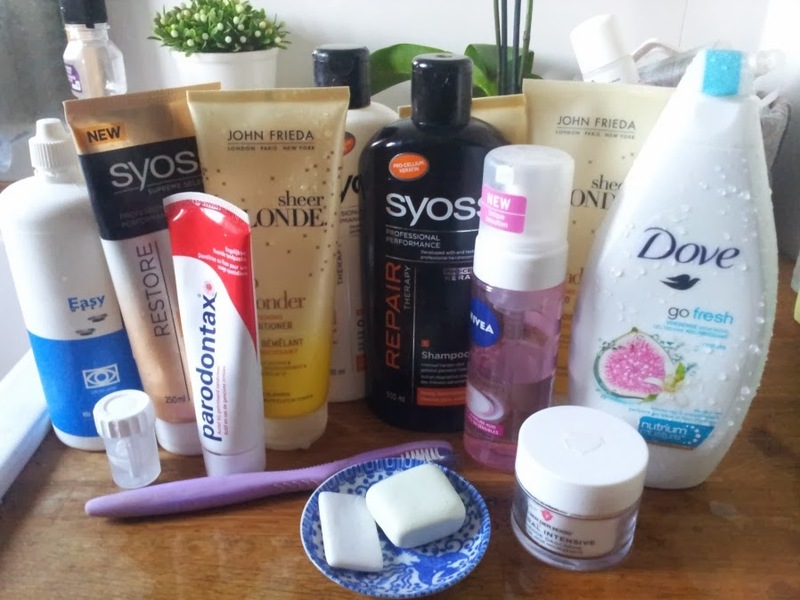 Deze week een gastblog van Marlies, die haar allereerste Plastic-Free Tuesday met ons deelt. Dit blog is op korte termijn ook te lezen op de gloednieuwe website www.plasticfreetuesday.com. Last week I tried out my first “Plastic-Free Tuesday”! I am happy to be the first one on this website to share it with you, including, of course, some of the ‘plastic-dilemma’s’ which I encountered throughout the day, and the attempts at their resolution! Not accepting new plastic bags when out shopping – I always just use my own (hand)bag/rucksack or whatever I have on me to carry new purchases. Is the bag too small (or non-existent), I use my (jacket’s) pockets as economically as possible or I carry extra stuff by hand. If it’s really too much and I have no other place to store it, I opt to leave it and come back later (better figure this out before check out though!) Also, when staff at a store already put something into a plastic bag without asking me first, I kindly ask them if I can also take it without the bag. This has never proven a problem! I also (especially) ask this at the bigger department stores, H&M, Mango, Zara etc. or when I am buying food at the market. This one I manage a near 100% I am proud to say. Not buying any plastic items for our house, only solid woods, natural fabrics, stone, cardboard and some occasional metal. In any case, no plastic furniture/laminated furniture, decorative items or floors. I can really recommend looking for nice second-hand/vintage wooden furniture or floors, which often have great style, are even (much) cheaper than Ikea or other comparable stores, way more durable, and often unique and made of good quality materials (solid wood!). Also, second-hand means you reuse/recycle, which means no new materials went into your ‘new’ item, and you prevented an item from becoming waste prematurely. So….. I thought I was doing quite well already with these few daily notes in the back of my mind when going out shopping. But, “Plastic Free Tuesday “ is a true eye-opener also for the relative plastic-conscious! 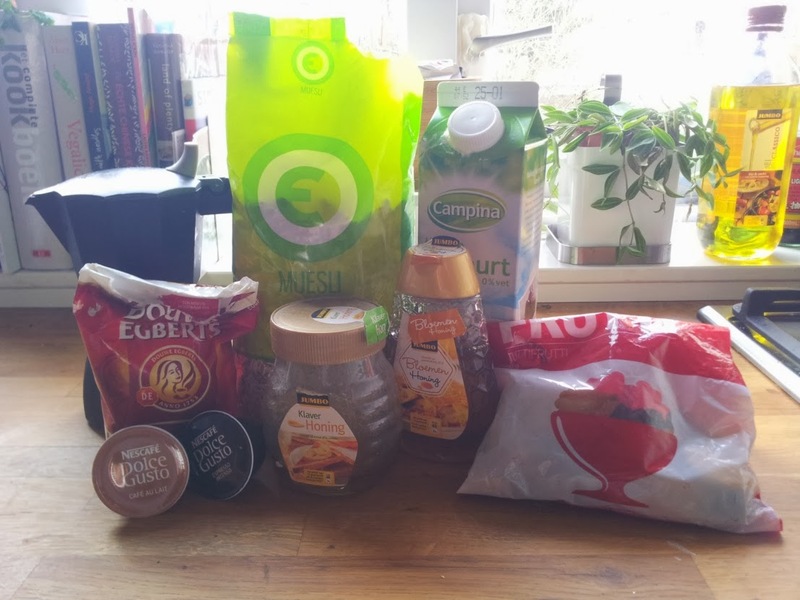 So here goes for a short report of my rather “Plastic FULL Tuesday” – and how I hope to turn it into a fully “Plastic FREE Tuesday” next time. 8:00-12:00: Waking-up, breakfast and a pretty plastic free morning! Pfewww.. so much plastic!! Is there a need for all these plastic bottles and containers I wonder…? I decide that at least unnecessary are: my big plastic hair brush (not in the picture) and all shower stuff. I used to be a fan of the products of Lush who sell many of their products without any packaging (shampoo-bars, soap-bars, hand-cream-bars etc. ), and which generally smell really nice and are largely made of natural ingredients (the small square soap in the picture is theirs – it is so tiny and plastic-free compared to the mess surrounding it!). I am not sure why I stopped buying their products, but I decide to make sure to find a Lush-store before my current products run out. They are not in my home city unfortunately, so I need to think about it the next time I am in The Hague or Amsterdam. I prefer not to order any stuff online if I don’t have to, it seems an unnecessary additional process of delivery. I use the remainder of the Lush-soap on the occasion of this “Plastic-Free Tuesday”, but still get the shampoo and conditioner from the plastic bottles for now (I see Lush even has plastic-free conditioner-bars! Will need to look into that). If any other tips besides Lush, please, more than welcome. I also wonder whether the contact fluids, plastic toothbrush, the toothpaste and facial crème can be purchased fully plastic-free..? I doubt it, but I will try to find out. (Admittedly, I think I may take “Plastic-Free Tuesday” a bit stricter than the original meaning: I am aiming not to touch/use any objects which involve plastic the entire day, and identify such products for future plastic-free replacement..). That this stricter approach makes sense, is soon clear from the fact that I already have some plastic-free options in my cup-board besides the plastic ones, which I could have easily shopped plastic-free in the first place (honey in glass v. honey in a plastic bottle?)! A normal breakfast nowadays entails muesli with some added ‘goodies’ – e.g. dried fruit, nuts –, yoghurt and some honey. I decide to pour the muesli despite the plastic packaging, for lack of another breakfast option today, and I wonder whether muesli is also sold without plastic packaging, (probably not)… also, is yoghurt is still available without plastic cap..? (this goes on my list for later (super)market research! Conclusion: yes it is.)) I leave the dried fruits today (because in plastic), I take honey from the glass container, and make coffee with the percolator, rather than sticking one of the plastic cups in the machine. Apart from the muesli, plastic cap on the yogurt and the plastic lid on the glass honey jar, this could have been worse…? But… It could also have been better. I think these products can be replaced with/substituted for something totally plastic-free. So, I will think about a complete plastic-free alternative next week. (My main lesson for this “Plastic Free Tuesday” will turn out to be; everything is in plastic! Plastic free living requires some planning! – which, of course, is ridiculous, it shouldn’t be (made) that hard not to consume plastic!! But next week’s PFT will start with a bit more planning I guess, and of course as this blog expands we can hopefully help each other find PF-products). The rest of the morning is perfectly plastic-free – apart from the plastic machines I tap away at at work (computer, laptop, phone), but also due to the pencil used and the paper post-its, instead of plastic ones. I decide not to have another coffee, as I am not sure whether the machine at work will be able to deliver it to me plastic-free, and I feel I need to make up for breakfast. Lunch turns out to be another challenge – again, because not well enough prepared. Normally I have two sandwiches and a cup of soup at our canteen. The sandwiches are no option today, because they are wrapped in plastic. The soup, technically, also not an option, because originally delivered in plastic bags. Further inspection of the canteen proves it is virtually impossible to have a plastic free lunch option though. So, in the end, I settle for the soup, with the optional bread rolls (which are offered unpackaged, but no doubt came to kitchen wrapped in plastic) and a fried snack (for which counts the same as the bread rolls I presume…) Hmm this is not a very successful lunch …. Next Tuesday I will prepare my own lunch from home. No more coffee in the afternoon, but hot tea water from the hot water tab at work. No more plastic used. Then, dinner-time, what I took, beforehand, to be the greatest no-plastic challenge of “Plastic-Free Tuesday” (I was wrong)! Considering the plastic challenges already encountered throughout the day, I decide not to make my first “PFT”-dinner too difficult,pasta it is! This should be easy because spaghetti can be purchased in a cardboard container at my grocery store and pasta sauce in a glass jar. Rest the veggies, which are surprisingly largely unavailable in our supermarket without additional plastic packaging... We get: plastic-free tomatoes, zucchini and carrots (onion and garlic already at home). Unfortunately mushrooms, eggplant, bell pepper, nor spinach can be found without plastic (unless from the freezer), so it wasn’t ideal. Also we left the meat-replacement due to lack of no-plastic options. So while finding products was a relatively easy plastic-free affair, it could be made more appealing if we had done some plastic free veggie shopping beforehand, say at the market place (luckily we did still have bell pepper and eggplant without plastic wrapping from the weekend shopping at the market). A final thing not accounted for upon dinner-time was the cheese, which we had at home in a plastic wrapper and, thus, decided not to add. The coming weeks I follow up on my plastic-free shopping list, and make sure to prepare some breakfast and lunch options for my next “PFT” during the coming week. If any tips, they are very welcome! Overall, my guess is it is very well possible to go plastic-free, also more structurally, but it needs some planning and potentially a few structural adjustments. In any case, I am looking forward to report (more successfully) on my next “Plastic Free Tuesday”, comments welcome! Zeep kun je in papieren verpakking bij de Droom van Utrecht kopen (Aleppozeep, misschien ook nog andere soorten). Je kan evt eieren gebruiken in de pastasaus. Kook dan de eieren los en voeg ze helemaal aan het einde toe als de pasta+saus al op je bord ligt, in stukjes gehakt. Dan is het 't lekkerste! Bedankt voor de reactie en tips selenejapan! daar ga ik eens goed naar kijken! Like you, I used to shop at Lush. I LOVED their products. However, unfortunately I read a book about the ingredients present in cosmetics and personal care products. Ever since, I carefully study the ingredient list before I buy any product. And I stopped buying products at Lush. In fact, I now only use very few products. My favorite alternative to Lush soap bars are Nablus soap bars, made in Palestina. De Tuinen used to sell them, but they don't anymore. I now order them online through De Groene Drogist. They don't use any plastic packaging. Thanks, I remember checking out the exact ingredients in the Lush products before, but I can't remember what my conclusion was.. What was yours? Which ingredients (in which products) didn't you like? I have not fully decided on such matters yet, although I generally buy my cleaning products from ecofriendlier brands, such as Ecover - which also uses 'plantbottles' I saw. About the other suggestion, thanks!! I am actually potentially very sympathetic to the idea of buying products from the West Bank made by Palestinians there! especially considering recent controversy over products from the 'occupied territories' as being sold as from 'Israel' (the occupation and Israeli settlements are illegal according to international law, and the situation itself of course politically super complex). So it would have to be a rather conscious choice for me to buy the Nablus soap, which requires a bit more digging for my part to find out what is going on with those soaps. (any thoughts or research on this yourself)? The website sounds very interesting at least! By the way - that is another thing I have already noticed about plastic-free buying, it might sometimes clash with other social/environmental matters I find important - i.e. someone mentioned to me the environmental strain of transporting glass v. plastic. I definetely hope to be clearer on these issues later a well! Also, as I wrote in the blog, I have a thing about delivery, and prefer not to (i.e. extra transportation strain on the environment for delivery of that one product..) but, I'll definitely have a look! thanks again! This is very useful! Bij de Lush in Den Haag heb ik een boekje gehaald met alle ingredienten van alle producten. Yes, there are many other environmental considerations as well, such as glass versus plastic. I try to get around this particular one by trying to buy things without any packaging. For example, I bring my own jars when buying nuts or dried tomato's. Generally speaking, I have no less packaging waste in all categories then a year ago. I will really look into the Nablus soap, I really like the idea of the whole product, and the smells seem nice - I do prefer some smell on my shower product actually... But they don't resolve the shampoo-issue I think..? Any tips there? 1) egg with honey + rising with vinegar and cold water. Result: very greasy or dry hair, itchy scalp, very annoying. I tried this for a number of weeks. 2) not washing at all, only brushing with a brush (wood, pig hair). I tried this for over one month! Result: Very Greasy Hair. Not good. 3) washing once a week with baking soda paste (5 teaspoons + some water, just enough to make it wet, but not too fluid). I take some baking soda on my fingertips and massage my scalp (wet hair) with it for like half an hour or so. Afterwards I rinse it with warm water and then rinse it with a vinegar (schoonmaakazijn)/water mix. Finally I rinse my hair with cold water. Result: Works fine for the first 3-4 days, then increasingly greasy hair. Not sure what would happen if you do this twice a week. I have a feeling that the scalp might not appreciate it very much. 4) Haarzeep (hair soap bar) from Werfzeep.nl. I tried it once. Only after a day very greasy hair again. So at the moment, I use number 3. Have done this for many months. No doubt people have at times wondered why my hair is so greasy (I never dared to tell anyone about this experiment, but well guys now you all know! ), but well, I am persistent. For more inspiration on this topic, you could look for no-poo information online or no-poo forum where people exchange their no-poo experiences. It's a bit expensive, but I've found it very useful! It notes which ingredients can be irritating to the skin, and for some ingredients it also says "avoid if possible". True! However, it's hard to find a computer without plastic. I have done some searching on the internet, but have not been able to find a non-plastic alternative. @ duurzaamtoch: you are very right..! I am not sure if there are many jobs which you can do nowadays without using a computer/plastic nowadays though.. So in that sense I think I am already doing pretty fine in my work by not using any additional plastic - just a fair amount of paper.. which I am not too happy about.. and I fly to (European) conferences at least 2-3 a year ... so that's a main concern at the moment.. I really liked your blog btw, and have already shared the animation with friends, very impressive. Good luck! That book sounds awesome! Have you tried the baking soda yet? What did you think about it? It's the same as zuiveringszout. Baking soda is sold at Asian supermarkets. In order to balance the pH value, I use baking soda and vinegar afterwards. Oh yes, and by the way, I am trying out for a more or less 'plastic -free' week this week, as doing plastic free tuesday already requires some planning, I figured I might as well plan for a couple of days more.. :-) hope to have a follow up post soon. It is going relatively well. By the way: any tips on plastic free yeast for bread, made my own focaccia, and I thought it was plastic-free, but the dried yeast is sold in plastic.. If you want to use yeast anyway, you could try buy it at bakery shop. As a teenager I worked at a bakery and every now and then people would ask to buy some fresh yeast. You could bring your own container.